Koringa, a magicienne of the 1930s, creatively reimagined yogic referents to enhance the allure of her act. It takes some kind of woman to take on a crocodile. Look magazine’s cover from September 1937 shows Koringa, the beautiful mystic, crouched low, staring down her adversary. She positions her arms like the jaws of the croc, only wider to intimidate him. A caste mark on her forehead glows red like a third eye, suggesting hypnotic powers. She claimed to be from India, orphaned at the age of three and raised by fakirs who taught her magic so that she could charm snakes, read minds, or walk on beds of shattered glass. In truth, she was Renée Bernard (1913–1976) a dancer from Bordeaux, who was a member of a traveling circus, a popular entertainment in France from the 19th century on. Bernard’s main act was a quick-footed dance on a ladder made of sword blades. Her performance impressed the Mills Brothers of England, who immediately engaged her as a star attraction of Bertram Mills‘ Circus and Menagerie. Reflecting the public’s romanticized fascination with India, Bernard and the Mills Brothers created the persona of Koringa, “The Only Female Fakir in the World.” A striking woman, Bernard heightened her exotic look with “Orientalist” costumes—short leopard-print dresses (via dresshead) or pantaloons with sequined tops—and a dramatic, auerole hairstyle. She dusted her body with a green-tinged powder before performances to give her a glowing, otherworldly appearance. A poster for Mills Circus in the Sackler’s upcoming exhibition Yoga: The Art of Transformation shows Koringa in green, posed like the Look cover only surrounded by snakes as well as crocodiles. Koringa remained with the Mills Brothers through the 1960s, touring England, France, and South Africa. 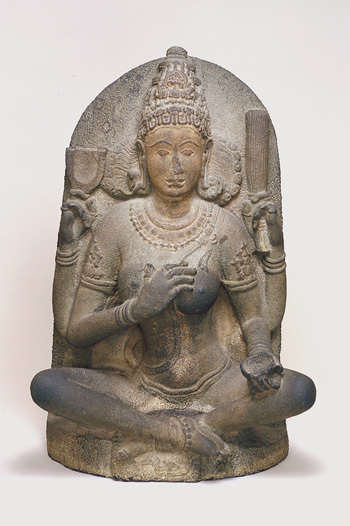 Today, we may see Koringa as a product of a colonialist fantasy of India and “the exotic woman.” But Koringa’s attributes of the crocodile and snake also appear on a 10th-century sculpture of a yogini goddess in the Sackler’s collections. One of a cult of goddesses worshiped in a temple at Tamil Nadu in Kaveripakkam, south India, the yogini came to the aid of the faithful and helped them achieve worldly powers and success. Renée Bernard’s Koringa can be interpreted as an homage to these ancient goddesses, who in turn helped her achieve fame and fortune.